In Method, a sales opportunity is a source of potential revenue. Where a lead is a potential customer you haven't done business with (the person), an opportunity represents the potential business (the revenue). 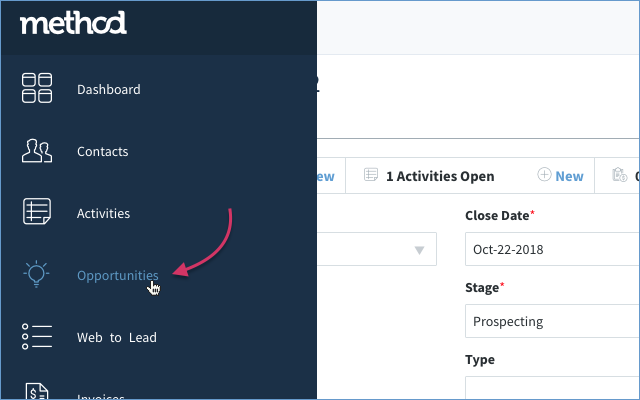 Creating an opportunity in Method allows a sales rep, or a sales manager, to track the progression of the sale as it goes through the pipeline. The pipeline expresses the value of your current potential sales, and it changes the further the opportunity advances. 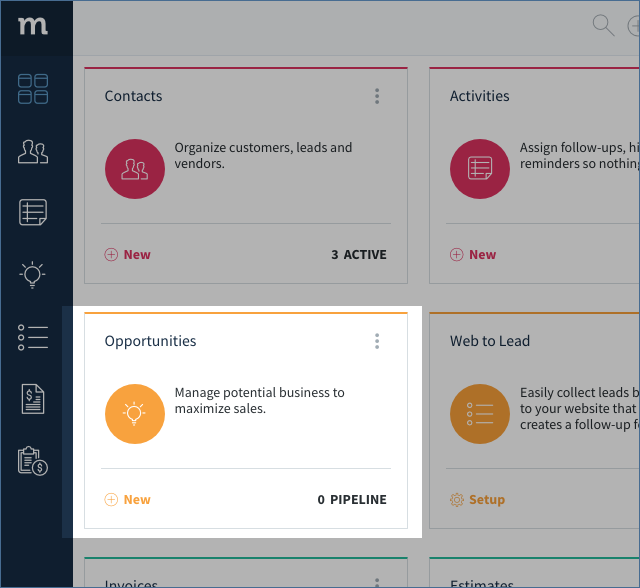 If you do not see the above app on your dashboard, then you will need an administrator to give you access to the Opportunities app which is found in the Sales Pipeline pack. In the previous onboarding articles, we were creating records straight from the app ribbon of the contact. This time, we are going to start from scratch. 1. Click ⊕ New on the Opportunities app on the dashboard. 2. 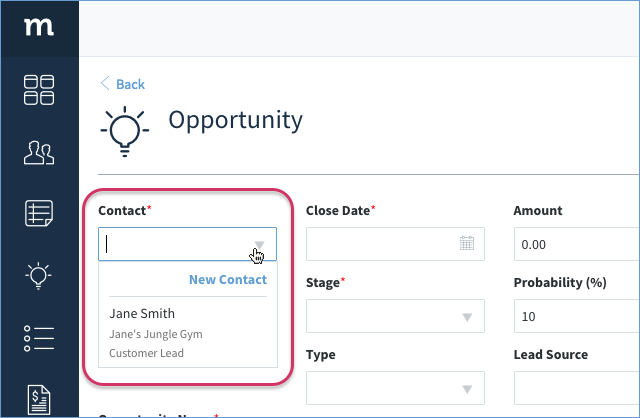 When the new opportunity screen comes up, you have a number of fields to fill in. The first required field is the Contact field. Note that you can create a brand new contact from the dropdown. For now, select a customer or lead. 3. Enter in the next required field, the Opportunity Name. This name will show up in the list of opportunities. 4. Below that you will also find a field for the user you want to Assign To this opportunity. It will default to your user, but you have choice to assign it to someone else. You also have the choice to notify this user with the checkbox below it. 5. The next few fields add more detail to the opportunity. Below is a description of the fields as well as suggested values to input for our example scenario. Close Date* - This date is when you hope to close the deal. Enter in a date a week or so from now. Stage* - Track the progression of the opportunity. This will automatically update the Probability field. The higher you progress, the higher the probability of success. Set the stage to Prospecting. Type - You can choose the stock types, or create your own types to help you categorize your opportunities. Next Step - This field can be a note to yourself to help keep track of your next step, although all interactions and reminders would be done through activities. Amount - This is an estimated amount you expect to get if the deal closes. Enter in any amount you wish, for example, $10000. Probability (%) - This is the probability of success. The pipeline is calculated by taking this percentage of the amount. The probability will be automatically filled in based on the stage you chose. Lead Source - Common sources of where this opportunity came from. Tags - Categorize your opportunity. 6. The Description field should make sense. You can put in information that describes the opportunity. You do not, however, need to keep a running track of your interactions here. That is done with activities. 7. Speaking of activities, we should create a follow-up for this opportunity so we do not lose track of it in the future. Check Create a Follow-up Activity. 8. A new section will pop up for you to enter in the information for your follow-up. Fill in the required fields for the follow-up. 9. Great! At the bottom of the opportunity, you will find a number of buttons. Here you can duplicate the opportunity, or send an email to your contact. For now, hit the Save button and save your opportunity. 10. Amazing! You created your first opportunity. 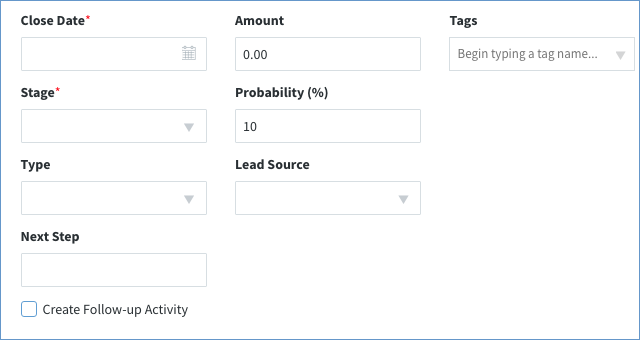 If you scroll to the top of the screen, in the upper right, you will see the sales pipeline has been calculated. This is the probability multipled with the amount. 11. Also at the top, you should see the records associated with this opportunity. As you can see, there is one open activity so far in the app ribbon. That's the follow-up you created in step 8 above. 12. Let's go back to your list of opportunities. On the left menu, select the opportunities icon. 13. This will take you to the opportunities list screen. You should see the opportunity you created. (If you don't see it, you may need to change the view filter dropdown above the list). 14. One final thing, in the upper right of this screen, you will find a link to Opportunity Reports. At this moment, there isn't much to see considering you only have one opportunity, however, for further reading, see our article on Opportunity Charts and Reporting. And that's it! Congratulations, you are finished with the onboarding tutorial walkthroughs. Feel free to go through the help center to learn more about Method. If you have any further questions, or wish to book a one-on-one, personalized session with our success coach, please message us in chat and we will be happy to help you. Thanks for joining us, and have a great day!